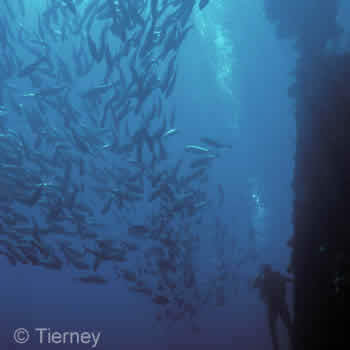 The Lipah Bay dive site is located south of Amed and is home to a wonderfully rich reef. It is also the resting place of a fabulous little shipwreck, a Japanese Wreck which is encrusted with black corals, soft corals, sponges and sea fans. Approximately 7km further along the coast from Jemeluk, this small Japanese steel freighter wreck lies in very shallow water (6-12m) in a quiet little black sand bay called Banyuning. Although I don’t get to dive here as often as I would like, each time I come here I leave feeling I have had 2-3 ‘good’ dives and that I’ve been able to thoroughly check out the site – only possible because it’s a small wreck. I doubt anyone would feel they had ever seen the entirety of the USAT Liberty Shipwreck in Tulamben Bay! This Japanese Wreck is encrusted with black corals, soft corals, sponges, and Gorgonian sea fans (sometimes with Pygmy seahorses). The inhabitants include anthias, parrotfish and angelfish. Visibility can be greatly reduced if there is a current or any wave-action, however the bay is well-protected on both sides. The shallowest section of reef contains Table and Staghorn corals and is home to clouds of damsels and anthias as well as schools of many kinds of fish; while the 15-20m section of the sloping reef is great, with soft corals, more Gorgonians and sponges, and dotted with nudibranchs. The reef continues in patches to 40m+; look out for ghostpipefish, Demon stingers, unusual dragonets and similar. Book Your Bali Diving - Japanese Shipwreck Today!